Welcome to the home page of the 64th Annual St. Patrick’s Day Hamfest & ARRL West Texas Section Convention hosted by the Midland Amateur Radio Club. The hamfest will be held March 16th, 2019, at the MLK Community Center in Midland, Texas. Check out all the pages on this website for the most up to date hamfest information. If we have your email on file we’ve emailed past attendees with a link to this website in order to reduce our mailing expenses. For others our traditional hamfest flier was mailed out in late January. You may also download the flyer. In addition to our normal hamfest prizes we are again raffling an Elecraft K3S transceiver with MH4 microphone. A maximum of 300 tickets will be sold at $20 each. Don’t delay, they’re going fast! For complete details please visit the raffle page on this website. We look forward to seeing you at the St. Patrick’s Day Hamfest! 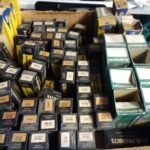 Check out some of the cool stuff our vendors are bringing to the hamfest!